It started with Mrs. O’Leary’s cow. The field of architectural engineering owes its beginning to the Great Chicago Fire when, on Sunday evening, October 8, 1879, a fire swept through the city, burning more than three square miles, leaving approximately 100,000 people homeless and 300 people dead. The estimated property loss was $190,000,000, or approximately $450 billion in 2016 dollars. 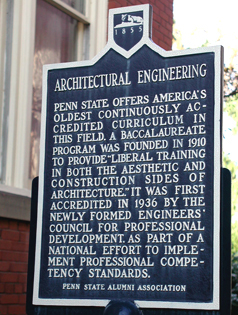 Architectural Engineering historical marker, located at east entrance to Engineering Unit A, University Park campus. While the fire was never actually traced to a cow kicking over a lantern, a gradual change took place while Chicagoans rebuilt their city. Structural steel was developed, the first skyscraper was built, and structural and civil engineering gave birth to architectural engineering. At Penn State, drafting and mechanical drawing were part of the art curriculum from the time of its founding. In 1889, President Atherton proposed to the Board of Trustees that a Department of Industrial Art and Design be created. Anne Redifer, as instructor, developed courses to include painting, drawing, modeling, and design. Over the next several decades, as Penn State’s colleges were reorganized, architectural engineering became a four-year degree program under the College of Engineering. Students studied building construction, lighting, heating and ventilation, and structural design and analysis. By 1948, a fifth year with a thesis or final project became a requirement for obtaining an architectural engineering degree. The final project was to re-engineer an existing building in all its aspects: structural, mechanical, electrical, and acoustical. In the 1960s, architectural engineering entered the computer age with the CAD (Computer Aided Design) Lab. Professors Gifford Albright and Larry Degelman developed MODCON (Man-Machine System for Optimum Design and CONstruction), giving researchers and students access to state-of-the-art hardware and software for design and graphics. 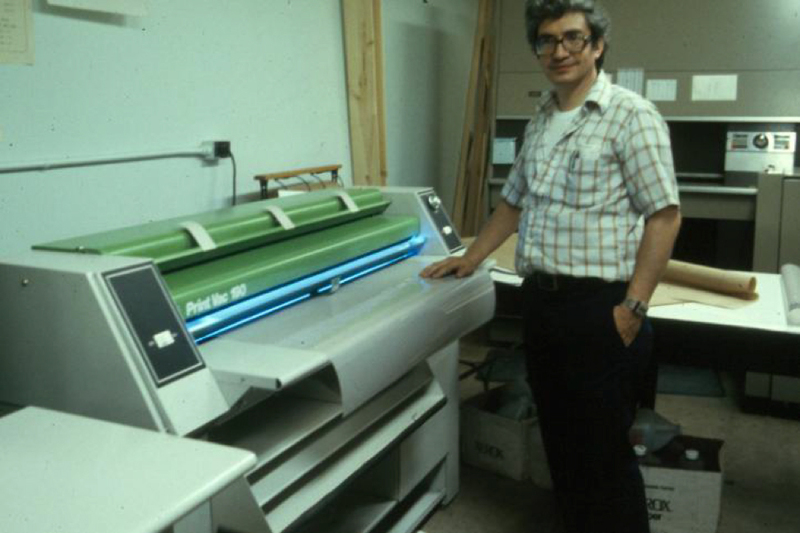 The AE Copy Center was the first in the area to own an Ozalid machine capable of printing full-sized blueprints. Jack Futrick, staff member, and the Ozalid in the early days of the copy center. 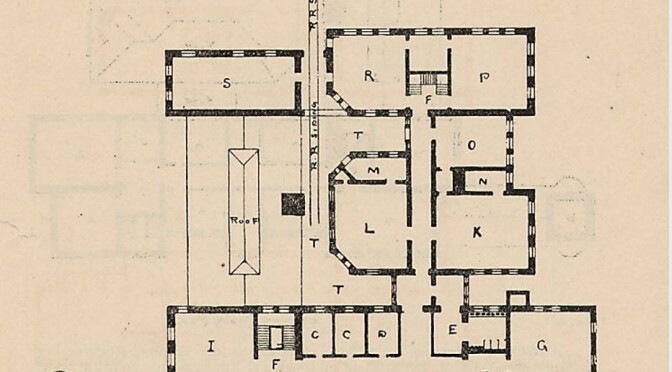 Research in architectural engineering has been instrumental in changing building codes to help structures and their inhabitants survive natural disasters, helping to construct spaces that allow people with various assistive devices to live independently, and making entertainment venues more comfortable visually, acoustically, and physically for patrons. Today, Penn State architectural engineering researchers are exploring computer-integrated construction and the use of cyber-physical systems to monitor temporary structures, such as cranes, scaffolding, and stages at summer festivals. Kevin Parfitt’s research emphasis is the forensics of structural failure. Somayeh Asadi’s research interests are designing energy-efficient buildings, self-healing concrete, and the use of sustainable materials for construction. Penn State has a bioaerosols lab and environmental chamber to research air handling systems and to test air quality, an immersive construction lab, lighting lab, and intelligent systems lab. The Building Envelope Research Lab advances research on the impacts of earthquakes, wind, and debris, and weathering on various types of structures. The MorningStar Solar Home is a 100 percent renewable-energy-powered home. It produces all of the energy it requires for power, plus a little extra for electrical vehicles on campus. John Messner, director of the Computer Integrated Construction (CIC) Research Program, is researching methods to visualize virtual full-scale integrated systems of buildings. One project involves making case studies full-scale and interactive in 3- and 4-D to analyze design and construction. Penn State’s Department of Agricultural Engineering continues to make the structures where we live, work, and play safer, more comfortable, and more energy-efficient. Members of the news media interested in Architectural Engineering research at Penn State should contact A’ndrea Elyse Messer at 814-865-9481 or aem1@psu.edu.